The Turkey Tender is perhaps the greatest example of Breton’s desire to unite realism and historicism within a single image. Jules Breton was born in Courrières, a village in the agriculturally rich region of northern France, and his intimate relationship to the land and the peasantry engendered in him a certain sympathy and tenderness that would characterize the interpretations of rural customs that dominated his oeuvre. Although his favored themes—gleaners, harvesters, and communicants—were popular subjects for realistic artworks and illustrations of genre types in nineteenth-century France, in Breton’s images, they are treated in an academic style traditionally reserved for classical figures. Against the blue tonal sky of late afternoon and the faintest indication of the Mediterranean Sea, a statuesque young woman sits atop a rock. Her pose is relaxed, as her arms rest against her thighs and her stick held between two fingers has slipped to the ground. The very weight of her body, evident under folds of clothing, is a contrast to her fine features seen in profile and outlined in a version of the brownish pink of her headscarf. The expression is pensive, or even melancholy, recalling images of symbolic figures representing those sentiments. The low vantage point positions the viewer to look up at her against the horizon line. These lines, later described by Breton as a “an expression of memory,” perfectly evoke the moment that captured his attention, and which he then committed to canvas. [v] In his later years, Breton distinguished himself as a writer with a collection of poetry entitled Les Champs et la Mer (1875), followed by the long pastoral poem Jeanne (1880). 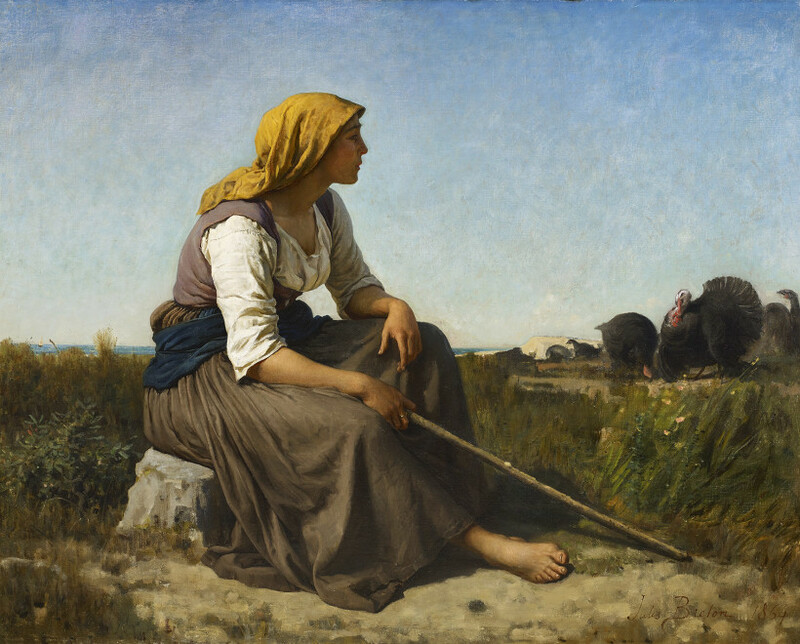 In assessing Breton’s long career, one biographer suggested that the artist’s two occupations had necessarily influenced one another: “in his pictures we see how the poet’s mind has guided the painter’s hand.”[vi] This is certainly true of The Turkey Tender. [i] Ernest Chesneau, Les Nations rivales dans l’art (Paris: Didier, 1868), 306. [ii] Pierre Gauthiez, “Jules Breton: Painter and Poet,” Art and Letters, vol. 2 (April 1889): 120. [iii] Theophile Thoré, “Salon de 1864,” Salons de W. Bürger 1861-1868 (Paris: Librairie Internationale, 1870), 91-92. [iv] Jules Breton, “La Gardeuse de Dindons,” L’Autographe (May 1864). [v] Jules Breton, Un Peintre Paysan: Souvenirs et Impressions (Paris: Alphonse Lemerre, 1896), 123.